click here for full slide-show! 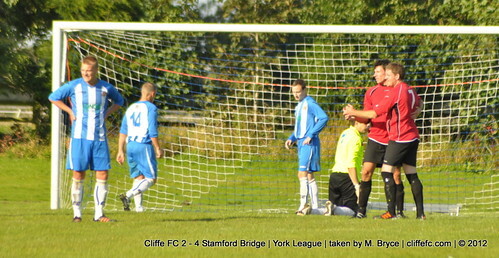 Four Stamford Bridge goals, three forced Cliffe FC substitutions, two Lee Carter goals and one disappointing performance in a 4-2 defeat. Stamford Bridge took the lead within the first 10 minutes when a speculative effort evaded Nick Brown in the Cliffe goal for 0-1, the less than ideal start was compounded when Nathan Parker had to leave the field before the half-hour after picking up a knock – Lee Carter replaced him. After some overplaying of the ball in Cliffe’s defence Bridge had a second on the 40th minute mark, 0-2, and again this was compounded with Billy Atton having to leave the field due to injury – Andy Kirkham replaced him. Substitute Carter, after having a penalty shout waved away, gave Cliffe a lifeline by hitting a bobbling daisy cutter of a shot into the bottom corner before half-time, 1-2 HT. Keith Tiplady, unhappy with his team’s performance, had his hand forced again when Ryan Sedman had to be replaced by Paul Tanton before the second half – again due to injury – and even ‘keeper Brown was struggling with a knock. No excuses though as Cliffe began the second half brightly and Carter got a second sight on goal, and hit a shot into the far bottom corner to make it 2-2. Bridge were under a bit of Cliffe pressure for a spell and Tanton was unlucky not to put Cliffe ahead before Bridge then re-took the lead when a counter long-ball was allowed the bounce leaving the Bridge forward to pounce and put his side back in front, 2-3. Cliffe with it all to do searched another equaliser but when a attacking Cliffe move rebounded off the referee, leading to a Bridge break to make the score 2-4, which was the final score. A bad result for Cliffe FC who now site 4th in the Division Two table after three games, 3 points behind early leaders Strensall. 1pm, Cliffe FC vs. Malton & Norton Reserves. || 3pm, Cliffe FC Reserves vs. York RI Reserves. 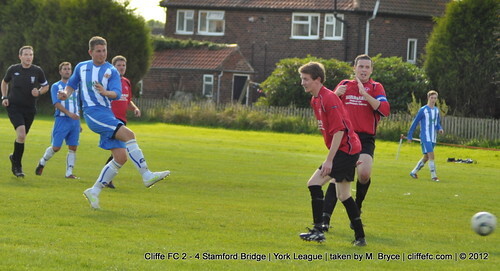 Cliffe FC Goals: Lee Carter (2). Cliffe FC MOTM: Wes Pears.